I’m not an artist. At least, not a visual one. I know what I want to see, but I find it hard to articulate in the most translatable way possible. I also find this to be kind of good, creatively, when collaborating. I’ll get pretty specific when I want to see something, but then other times I’ll leave it open-ended for the artist to play around and explore. Since that can be construed as bad writing or being flaky, I usually opt to include a little addendum in the script like, “The only main characters in the script are Harris and Shaw. The rest of the characters you can play around with. If you need further description, just let me know.” A lot of times, the artist will just go for it, and it’s a lot of fun to see what their decisions were. With the logo for FOTB, I’ve been busting my brain trying to articulate just what I want to see. I feel like I know exactly what I want, until I try to put it in words. I’ve even tried doodling a little to convey the idea, and it’s gone nowhere. This is actually rather crucial, because it’s the brand of the site, the strip, and the franchise. True, worrying about a logo can be seen as putting the horse before the cart, but I’ve written up the story outline and got a lot of scriptwork finished, and Nic has enough pages to work on to the point where feel like I can afford to spend some extra concern over what the logo design’s going to look like. Thankfully, a great big heap of cool dropped in my lap not an hour or two ago in the form of a design that I was thrilled by. I’m hopeful we can take the three designs I’ve seen and not just use one as the logo, but use the others (and other variations) as guides and images on the site. I love when creators integrate their characters or designs into the site; I feel it gives the place more of a destination, than just another strip in someone’s weekly rotation. I was worried about sharing sketches, but the fact remains: the site may technically exist, but nobody knows about it, yet. So what the hell? My main choices, I feel, are between 1 and 2. I love 3, but I think that’s where I got the idea for spreading the Binturong around. 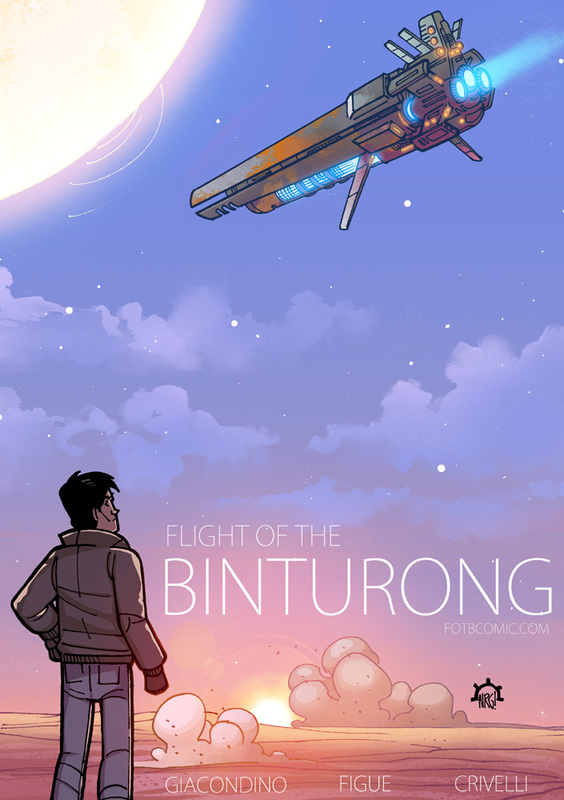 Since I’m not going to go the Cowboy Bebop route and put an actual binturong on board, I figured the metaphorical “binturong,” the personified embodiment of the ship and the tone of the strip, could strut around the site and indicate things like Twitter feeds and Facebook updates in the future. Edit: The logo is coming along really nicely, and I decided to go with a combination of #2 and another version that wasn’t featured in this post. The reason for my update is simple: I’m happy to say I’ve picked one I like, and we’re going full-steam ahead on it. Don’t get me wrong, though. I love #1, and I think I have use for many (if not all) of these poses, and more.